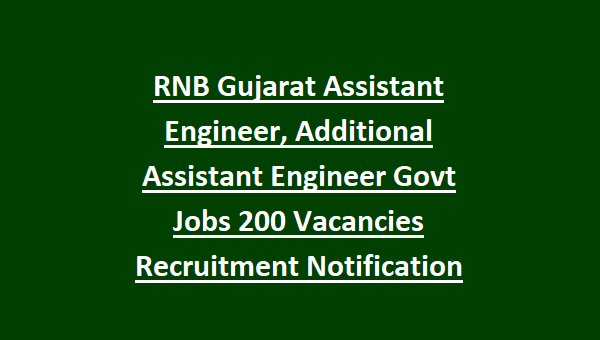 RNB Gujarat Assistant Engineer, Additional Assistant Engineer Recruitment 2018: Roads & Building Department released a recruitment notification for Assistant Engineer & Additional Assistant Engineer on contractual basis. A total of 200 combined vacancies are offered under. 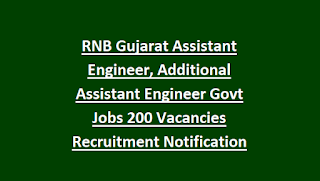 There are total 200 vacancies available in this RNB Gujarat Recruitment. Candidates applying to the Assistant Engineer Post must not exceed the upper age of 35 Years and below 21 years. Applicant’s age for Additional Assistant Engineer must lie between 18 to 35 years as reckoned on 31-08-2018. Candidates interested to work for Roads & Building Department must have secured a Bachelor’s degree/Diplomain Civil Engineering or any equivalent degree from a recognized University/Institution. Applicants who have successfully registered for the Engineer Jobs will be assessed on the basis of Written Examination/Interview. Written Examination will be based on syllabus as per the educational standards required for the post. Candidates interested can apply online through the official website http://www.rnbgujarat.org/ before the due date i.e. 31st August 2018. Candidates seeking possession under RNB Gujarat Assistant Engineer, Additional Assistant Engineer Jobs Recruitment 2018 can refer the official notification.